Photo provided by Folsom Lake College. 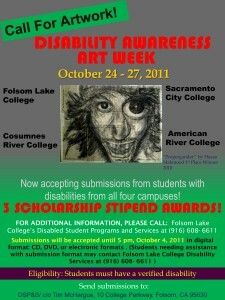 The fourth-annual “Students with Disabilities Art Show” will be held Oct. 24 – Oct. 27 at Folsom Lake College, presented by Disabled Students Programs and Services, a group that provides accommodations to students with disabilities. According to Christy Pimental DSPS assistant coordinator, the show is open to all Los Rios Community College District students with disabilities including those attending City College. On Oct. 27 a free community reception open to the public will run from 5-7:30 p.m. at the Falcon’s Roost on the Folsom Lake campus. Pimental said art is submitted and displayed digitally on monitors at Folsom Lake College and that awards presented at the community reception include: a $300 scholarship for the student voted “best of show” and two $100 scholarships for honorable mentions. Folsom Lake’s DSPS coordinator Tim McHargue created the show at Folsom Lake College when he saw it done at UC Berkeley and thought it would be a good way to showcase students’ abilities. “So many times, our students in the school environment are struggling and deal with negative stereotypes and we found that sometimes they have exemplary artistic abilities that don’t often get called into play,” said McHargue. Pimental said in the first three years DSPS had trouble raising money for the show. She says that isn’t the case this year because DSPS won a $2500 grant from the Los Rios Chancellor’s office. Pimental said that Folsom Lake’s DSPS is working to get the art shown at the other Los Rios campuses but currently it is only shown on the Folsom Lake campus. City College students have participated in the show in the past and according to McHargue, have been welcomed to participate this year as well. Pimental said that students really enjoy the show because it gives them an outlet to show off their talent. “It helps take me out of the style I’m doing and see that people with disabilities are capable of creating art work as well as anyone else,” said Richard White, a participant in this year’s show, majoring in art and media at American River College. According to Pimental, the number of art entries has ranged from approximately 60 – 160 over the last three years and she hopes to see the number of entries surpass 200 this year. This entry was posted in Arts & Entertainment, News, Sac City Express (SCC) and tagged art, awareness, city, college, community, disabilities, folsom, lake, los rios, sacramento, show, student. Bookmark the permalink.